Now coming to the recipe, i blindly followed Raks Kitchen's recipe and made it easily this morning. I tried this 3-4 times before but every time i went wrong with the sugar syrup or with cashew powder. But this time it's a successful attempt and thanks a ton Raks for this recipe. One extra step i did which she did not mentined, i sifted the cashew powder with mesh strainer...so that i got fine coarse powder :) As i made this today morning i was in hurry and not able to get proper step wise pictures. Please refer the original recipe for the detailed pictorial. Kaju Katli is my H's favorite and this morning He was so happy and enjoyed eating it. But i couldn't able to get perfect diamond shape, yes, i dunno h to cut them diagonally :( other than that it was awesome...is it not?? Grind cashew nuts in to a fine coarse powder using blender. Take a pan , add sugar and water and cook in medium heat . Keep stirring until sugar dissolves completely and get fine thread like consistency. To check this, take a small bowl with 1-2 tbsp of water and drop few drops of sugar syrup and it should form fine threads and is should not dissolved in water. (check the original recipe where she described with pictures). Then add cashew powder and stir well and keep stirring in low heat. Cook for about 3-4 minutes and when the mixtures starts bubbling and thick, wet your hands and take small piece and roll it u should be able to roll without sticky. that's the perfect consistency. Now turn off the stove and pour the cashew mixture to a greased plate or butter paper and wait for a minute and grease your hands and start kneading it gently like a dough. Then spread using your hands and place one more butter paper over the dough and roll like a chapathi using rolling pin. Then cut to your desired shape and Enjoy!! If u feel your dough to be hard just add few spoons of milk and knead n roll. it its too sticky , add some corn flour and knead using ghee. 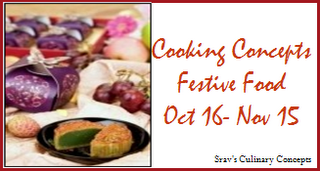 This is on its way to the event, Cooking Concepts 4 -Festive Foods happening @ Srav's Culinary Concept. wowww perfectly done dear!! very interesting to read ur love story..congrats!! Lovely n superb click of katli..the first one ,I just loved it!! Glad to know about your love n marriage n a happy ending...May god bless the family too!! Thanx for the sweet comments at my space,you re always among those few bloggers who had always supported my space every time,hope you continue the same! !Thanx again!! really very sweet memories! !perfect kaju burfi...looks perfect n yummy! Congrats for your special day interesting love story.Kaju katli looks awesome and perfectly done.I tried many times didn't come out perfect,will try it soon. 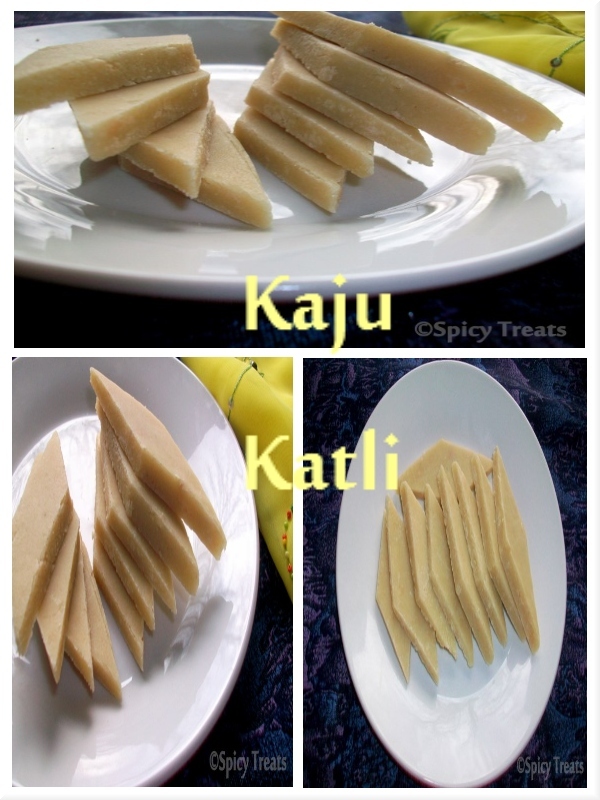 Kaju katli looks delicious.. cant take my eyes off it... fab pics..
Kaju Katlis look simply yummy and delicious. Wonderfully prepared. Delicious kaju katli,looks so yummy. Lovely story about the start of your marriage! The Kaju Burfi looks fantastic. My mom makes something similar but with almonds! Sangee loved the story as well as the kaju katli. The top banner as well looks very good. Happy Anniversary Sangee. Nice choice of recipe to celebrate. Awesome perfectly made.. i know making love marriage into arranged and the day both the parents accept is the best day of r life..
looks awesome and thanks for sharing the recipe. The cashew sweet is looking perfect Sangee. Thanks for sharing your sweet memories Sangee. Perfect, soft, too tempting katlis!! Luvly,perfectly shaped and done Kaju-katli - Bookmarked it. Luks so perfect...Great to ready story. wow, kaju katli looks yum dear..perfect for such a great occassion, nice knowing more abt u..May God bless u n ur family !! The story is more interesting than kaju katli! ;) nice way to celebrate the occasion sangeetha!